It's a simple story, really. I made a batch of homemade croissants one night, had some leftover, and made bread pudding the next night. I also had the apricots and chocolate... the almonds... brandy and apricot preserve... so it made this whole weekend experiment a lot easier. And THANK the dessert gods I did!! Dang, this is good! I hope you enjoy and much as I did. We did. Mostly me, because I kept it all. Adding in the cream and milk. Begin by boiling water and pouring enough over the dried apricots to cover. Set aside for 15 minutes. Butter the inside of a large casserole dish or high sided oven-proof skillet. Dice the stale croissants, or any rich dough based dinner rolls, into 1-inch pieces. Place into a large mixing bowl. Add the roughly chopped chocolate, morsels, or chips. Drain and pat dry the halved apricots. Add to the bowl along with the bread and chocolate then set aside. In a separate bowl, combine the whole eggs and the egg yolks. 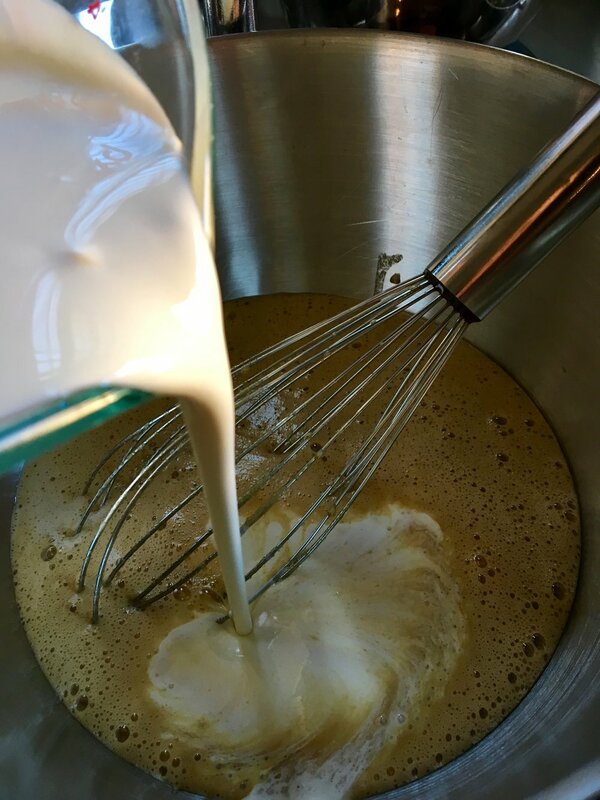 Give it a nice mix with a whisk until smooth. Add the brown sugar and the granulated sugar and begin to mix vigorously. Whip until pale brown and smooth. Pour in the cream and milk along with the vanilla and almond extract. Mix in thoroughly and set your custard aside. Give the bread, chocolate, and apricots a nice toss with your clean little hands. Scoop out the tossed mixture with your hands and place into your buttered casserole dish. Pour the custard slowly over the bread mixture making sure every inch gets coated. Pour enough in until it just reaches the top of your casserole dish. With a spoon or rubber spatula gently push the bread down into the custard to make sure the bread is somewhat submerged. Let the mixture soak covered for one hour. Begin to preheat your oven before the hour-long soak is complete. 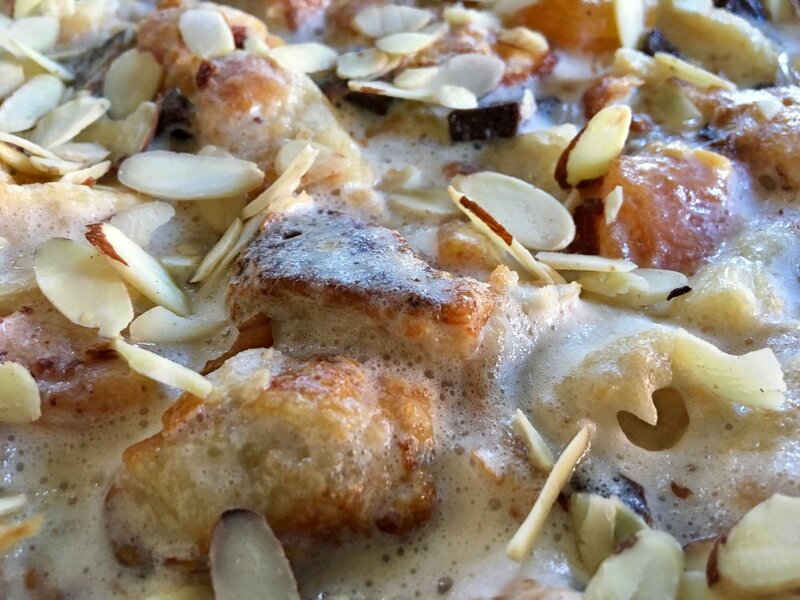 After an hour uncover your pudding and sprinkle the sliced almonds on top. Place the bread pudding into the oven and bake for approximately 40-45 minutes or until the center has puffed up and there is slight jiggle. 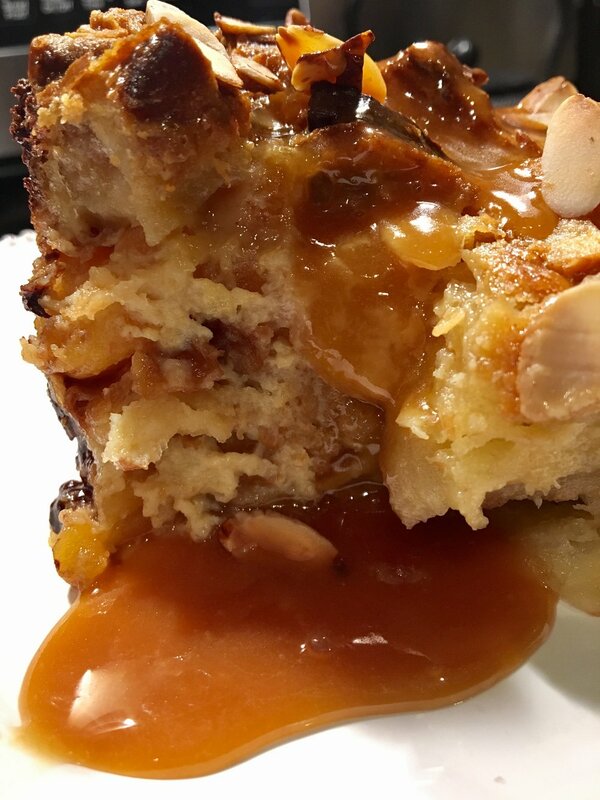 Remove from the oven after cooking and let the bread pudding cool and set-up while you make the caramel sauce. Yes.. I said Caramel Sauce. Soaked and ready for the oven! Combine the sugar, water, and lemon juice in a heavy bottom saucepan. Mix together and begin to heat to simmer stirring occasionally. In a separate pan add the brandy and ignite to burn off excess alcohol. Do this carefully and mindfully. It helps to gently warm the brandy in the pan first then ignite with either a long handled lighter or tipped gently towards a flame. Swirl the lit brandy around to burn off the alcohol. Add the apricot preserve into the brandy and gently simmer. When the sugar water and lemon syrup starts to lightly turn amber, really pay attention because the caramelization will come on quick. Keep stirring and when it starts to turn a medium dark golden brown remove from the heat… still stirring. It will continue to cook and darken further. Gently pour in the apricot brandy syrup into your caramel. It will bubble a bit and that's okay, just keep stirring. Add in your knobs of butter to finish off your caramel sauce and mix in. 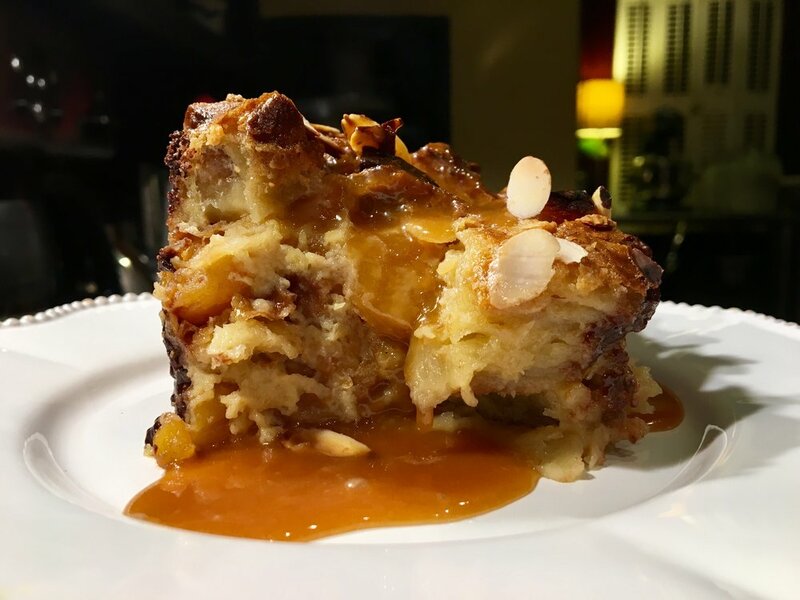 When ready to dig into your bread pudding, scoop or siliceous a nice serving onto a plate or pasta bowl. Gently pour on the apricot brandy caramel sauce… and dig in!